Mumbai Maharathi defeated defending champions NCR Punjab Royals 51-46 in the first match of the Pro Wrestling League (PWL) Season 4 at the Tau Devi Lal Indoor Stadium in Panchkula. It was Asian Games gold medallist Vinesh Phogat who clinched the tie for the Mumbai team winning the sixth bout of the evening to give her team an unassailable 4-2 lead with one bout to go. The other Asian Games gold medal winner Bajrang Punia, who fought the last bout against national champion Harphool, reduced the winning margin by clinching the final bout of the evening. Though up against the Asian champion, Harphool showed no nerves and displayed tremendous grit and determination before going down 2-8. As expected, the 53-kg category bout between Anju and Asian Games gold medallist Vinesh Phogat turned out to be a one-sided one. Anju, who won the gold in the girls U-17 53 kg category in Khelo India Youth Games two day’s ago, couldn’t keep the Asian champion at bay for too long and lost 8-0 when the referee stopped the bout. 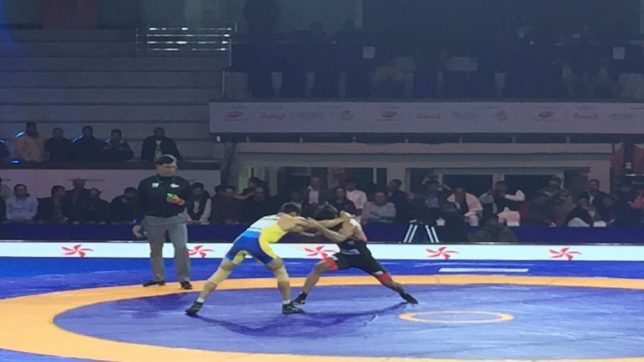 Earlier, former European U23 champion Russian, Ibragim Ilyasov of Mumbai Maharathi won the first bout defeating Nitin Rathee 9-7 in the 57kg category in the opening bout to give Mumbai the lead. “During the last season, I lost twice to Sun Yunan of China. Even though I lost the matches, I observed her game closely and it surely helped me during my opening bout in Asian Games. In wrestling, we often don’t face the same wrestler and playing against them in such leagues surely helps us. Talking about marriage, wrestling has been my first love and it was not difficult to restart my training after marriage. We enjoy wrestling more than anything else and our life has been dedicated to wrestling,” concluded Phogat. For more interesting content on Indian Sports, stay tuned with KreedOn.